Peter Jackson is famed for his adaptations of JRR Tolkien’s fantasy works the Lord of the Rings. But Jackson has eschewed fantasy for cold hard facts in They Shall Not Grow Old. The movie saw him painstakingly restore World War I documentary footage, adding colour and clearer sound. Bringing the stories of these soldiers to life, Jackson’s documentary is a window into the war in a never before seen way. When is They Shall Not Grow old out in cinemas? The documentary has its premiere at the BFI London Film Festival. This release is on October 16, 2018. The director will be partaking in a post-screening Q&A session with film critic Mark Kermode. The documentary will also be shown on BBC One on Armistice day on Sunday, November 11.
Who stars in They Shall Not Grow Old? Strictly speaking, the stars are the soldiers themselves. Jackson used archival footage from The Imperial War Museum to make the movie. He used original audio from BBC archives and the voices of war veterans for the movie as well. Then the film was colourised to make it feel both modern and accessible to audiences who are used to seeing movies in colour. 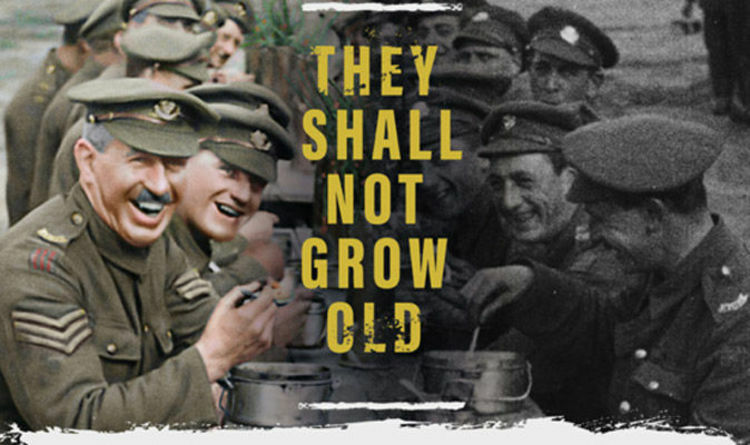 What is the premise of They Shall Not Grow Old? The documentary seeks to honour the lives of those who fought in the first World War. The Imperial War Museum writes: “The First World War proved to be a landmark in cinema history – the first time that the horrors of war could be caught on camera. “Many hours of dramatic footage were filmed on the battlefields, capturing the realities of the conflict in remarkable and unprecedented detail. “This footage provided the public at home with astonishing access to the frontline: The Battle of the Somme, a documentary film produced with the cooperation of the War Office, was seen by an estimated 20 million Britons in its first six weeks of release. Is there a trailer for They Shall Not Grow Old? The trailer is both emotional and technical. It gives not only a glimpse into the lives of the soldiers but also the transformation of the film from black and white to colour. The movie made a £557,000 ($730,000) in its premiere, and as a result of its critical and financial success is being given an extended run. They Shall Not Grow Old will be broadcast on the BBC on Remembrance Day, while its cinematic run has been extended due to high demand. Tickets for 2D and 3D screening can be found here.